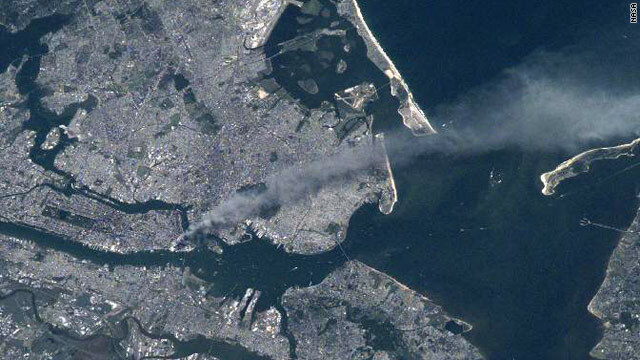 Astronaut Frank Culbertson captured this image as the International Space Station orbited above New York on 9/11. "I was flabbergasted, then horrified. My first thought was that this wasn't a real conversation, that I was still listening to one of my Tom Clancy tapes," Culbertson wrote. "It just didn't seem possible on this scale in our country. I couldn't even imagine the particulars, even before the news of further destruction began coming in." "Other than the emotional impact of our country being attacked and thousands of our citizens and maybe some friends being killed, the most overwhelming feeling being where I am is one of isolation." "It's horrible to see smoke pouring from wounds in your own country from such a fantastic vantage point. The dichotomy of being on a spacecraft dedicated to improving life on the earth and watching life being destroyed by such willful, terrible acts is jolting to the psyche, no matter who you are," he wrote. "It's difficult to describe how it feels to be the only American completely off the planet at a time such as this. The feeling that I should be there with all of you, dealing with this, helping in some way, is overwhelming." "I learned that the Captain of the American Airlines jet that hit the Pentagon was Chic Burlingame, a classmate of mine" at the U.S. Naval Academy, Culbertson wrote. "What a terrible loss, but I'm sure Chic was fighting bravely to the end. And tears don't flow the same in space ... "
Read Culbertson's letters in full. Michael Fury will never answer anything said to him; all he does is spam. His blog site has a comment section; we should all go over there and post links to CNN. Either that, or tell him what we REALLY think of his infantile attempts to write op-eds. Meanwhile, some people are taking his word for truth. Imho, he is just as bad as the Faye.org spammer. Everything I needed to know about Islam, I learned on 9/11. Unfortunately, that's what 9/11 taught most people. All religions have extremists (Waco for example). My History professor a couple of years ago read a passage to us that basically consisted of love all others, and do God's will by protecting them from evil. The phrasing of it made me instantly think of the Bible, although I couldn't place the passage. It was from the Quran. This is very sad and also very wrong. Then you haven't learned a thing. Why has been and is the American Democracy under attack by the Islam groups or from the left of Islam? What are their interests what they want? 9/11 is Bush teaching America how to hate islam. Thanks banasy. I have an older phone so I'm unable to go to web sites. Well I can go to them but most are too big for my screen. I'm due for an update in Oct. Would you believe I thought the Faye thing was real when I first saw it? Thanks to you and other poster's comments though, I caught on real fast. What's your opinion on 9/11 if you don't mind saying. Some people think it was an inside job but I never felt that way. I'd be interested in hearing your "take" on it because you seem to know a lot more about politics etc. than I do. Good morning! I can only imagine the helpless feeling this astronaut must of felt. To be out in space and hearing of this devestation through the radio. His friend (the pilot) was brave. He was a pilot but also human. LOL, just because you are paranoid doesn't mean they aren't after you. My husband thinks the whole moon landing was a hoax. I get tickled at the conspiracy theorists. I love that they exist. The entertainment is priceless. Never underestimate the benefit of a good belly laugh! Consipiracy theorists are weak and lazy, not even close to knowing the facts. So sad. Lucky he had his Brownie Instamatic with him. imagine what other war torn areas look like from space. we need to stop acting dumb! that you need to run gpupdate on the svreer to spread the updates accross the domain. This is wrong gpupdate only affect the computer it was excuted on. I am sure about it. If you run gpupdate on the svreer it will only update the svreer's own policy not the clients. He repeats this mistake many times.Another one is he doesn't know that group memebership only applied at logon so he tries changing group membership for some user and doesn't understand why it is not happening the why he want. Then just chat along to find some excuse out of it.I wrote to trainsignal twice about it and they have never bother to reply.